One of the many stereotypes that everyone has heard is that graduate students have no social lives. They’re shackled to the lab bench or desk, never to leave the fluorescent lights of the one building they know the name of. And yes, I’ll admit it—early on in graduate school it seemed inappropriate or taboo to admit that I had a social life. I made a pretty conscious decision in these early days to make it clear to my advisor, my peers, and myself that setting a work-life balance was very important for me. I realized that maintaining my emotional and physical health also meant maintaining a social life. So how did/do I do it? Through a lot of trial and error (what can I say, I’m a scientist! ), I have figured out four things that help get me outside the lab and socializing with others. Firstly—do things with people in your department. This seems like a no-brainer, but sometimes graduate school feels like a very solitary experience and it can be incredibly beneficial to surround myself with those who are going through similar struggles. And don’t stop with just the people in your lab, your specific group, or your cohort. For me, this means participating in events sponsored by my Graduate Student Organization, BUGS. These events range from pumpkin carving to career counseling to Easter egg hunts. 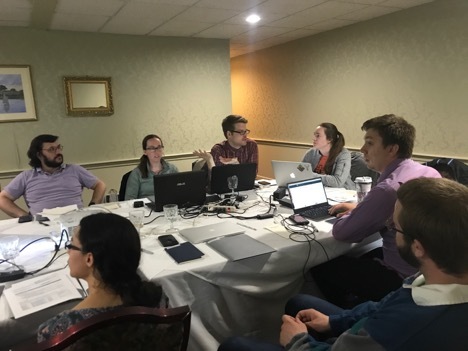 They have been excellent times for me to forge connections with others in my department that I don’t necessarily see every day. Secondly—do things with people outside your department. Now I’m not trying to sound harsh, but sometimes your own department can drive you nuts. Sometimes, I just don’t want to talk biology anymore. When I sense these feelings creeping in, I seek out more university-wide events that help me connect with students in other departments. For the most part, these are sponsored by the Graduate Student Council (GSC). 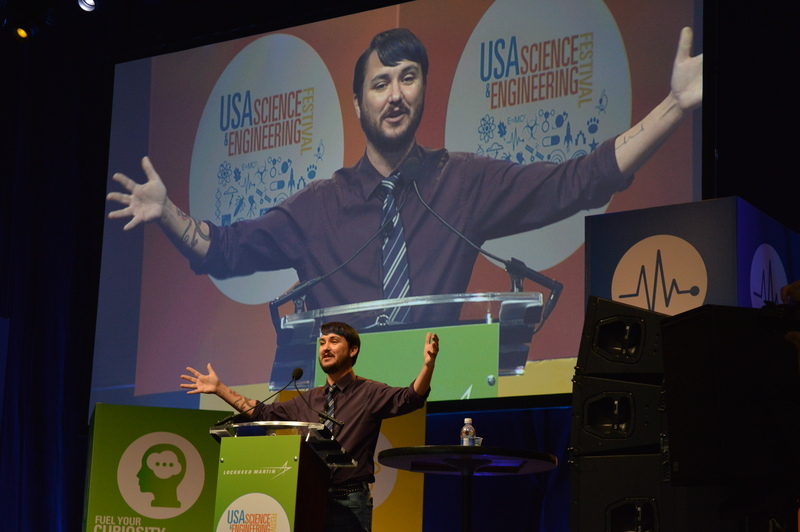 Last year, I joined the GSC as the co-chair of the Academic and Career Development Committee. In this role, I helped organize the Graduate Student Research Symposium—a fantastic event in the spring semester—which enabled me to meet people from the English, Fine Arts, Chemistry, Biomedical, Urban and Environmental Planning, and Computer Science departments. As Vice President of the GSC, I continue to meet and socialize with people across all the Tufts schools. These opportunities have helped re-center me when I’m feeling particularly bogged down with biology. Thirdly—do things with “real adults” AKA people outside of academia. Don’t get me wrong—I love academia and all the amazing people I have met through my journey. But it’s a bubble. And sometimes you need to get outside that bubble and remember that there is life outside of Tufts. For those times, I turn to my community sports leagues. When I first moved to Boston, I had no idea how many sports leagues there actually are. Two of the main ones are Boston Ski and Sports Club (BSSC) and Social Boston Sports (SBS). Through these two organizations, I have joined lacrosse, kickball, bocce, and inner tube water polo leagues. Yes, that would be a “sport” in which you sit in a blow-up inner tube and “play” water polo. The competitiveness and athleticism varies depending on the league and sport, but no matter what, these are great ways to meet people all across the city. And finally, and this one seems a little backwards, but—do things on your own. Speaking for myself, sometimes I need some alone time. I have found that taking some time to wind down on my own can be incredibly beneficial. Whether it’s by reading a book, listening to music, going for a walk, or just watching Netflix, this time recharges me and prepares me for the challenges of graduate school. So don’t be afraid to admit you have a social life. I hope that this post has provided some great resources if you need help jump-starting that social life! Me with other board members of Graduate Student Council. Through the GSC, I have met people from all different departments including the English, Computer Science, Physics, and Engineering Departments. Photo courtesy of Taylor Sands-Marcincowski. My inner tube water polo team celebrating our season championship. Sports leagues have gotten me out of the Tufts bubble and out and around Boston to meet some great people, and play some fantastic sports. Photo courtesy of Social Boston Sports. 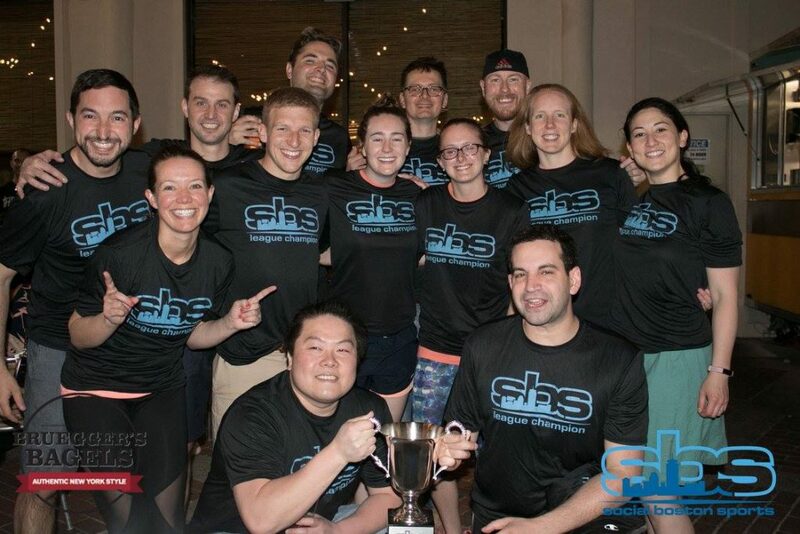 This entry was posted in Student Life and tagged Boston Ski and Sports Club, BUGS, Graduate Student Council, SMFA, Social Boston Sports, Social Life on January 22, 2018 by gthoma03. I’m coming up to the end of my PhD which means I’ve spent almost five years at Tufts University. I’m becoming nostalgic as the time to leave comes closer, and I’ve been thinking more about all the amazing experiences I’ve had in the USA. 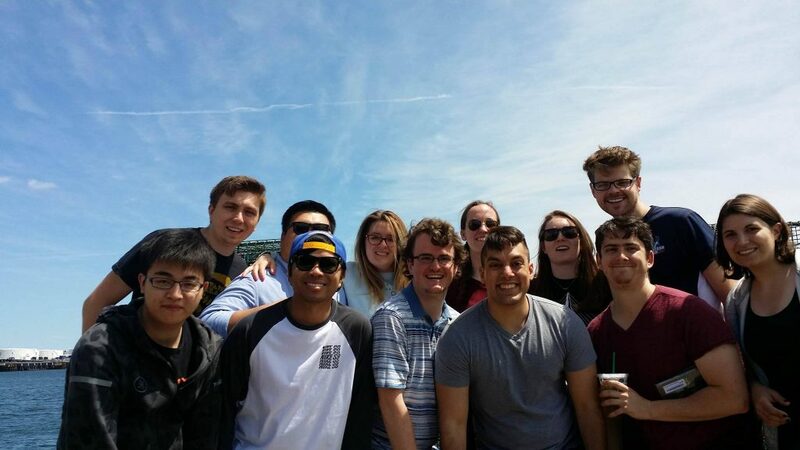 I thought I’d share with you some of the good memories Tufts has given me (and hopefully it’s not too sappy!). Me on fieldwork in Belize. 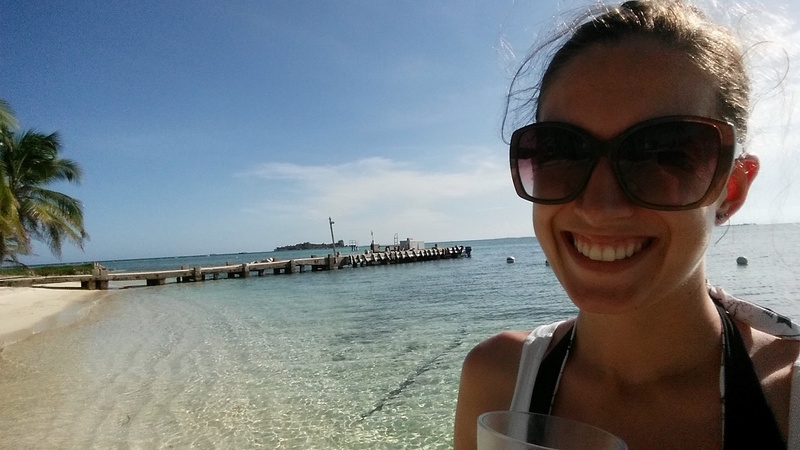 I conducted my fieldwork at the Smithsonian research station on Carrie Bow Caye. I moved to Boston in 2012 with my husband. When we moved, we knew no one in Boston and I’d never been to the USA before. Tufts has many facilities to help international students with the move. For example, the International Center can help with the essentials like paperwork and visas, and they also host events to help you get settled and meet other international grad students. One event that stands out is the international student orientation event. At that event I met some wonderful people that I could chat with about American culture. We became great friends and still regularly chat even though we now live in different states. The Graduate Student Council also organizes many outings and activities which makes it easy to meet other grad students. 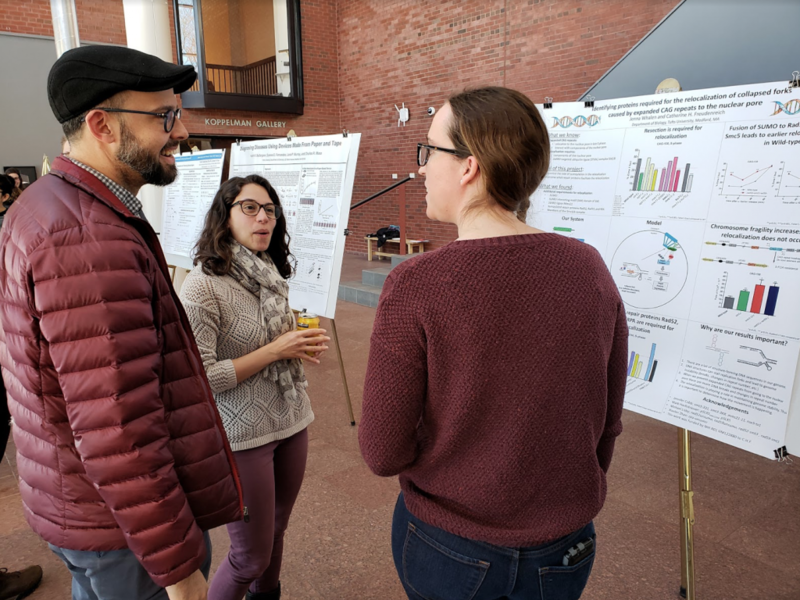 At these events, I had the chance to get to know other students in the Biology Department, and also to meet grad students in other departments. I now consider these friends my “American Family”, and wouldn’t be able to live here without them. A good graduate student council is so helpful for meeting people in an unfamiliar land! Tufts also provided great support for my research. As my research plan developed, it became clear that I was going to need a fair amount of research funds (I had decided that I wanted to conduct fieldwork in Belize). 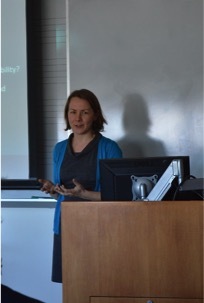 The Graduate School of Arts and Sciences has a grad student grant program. This scheme was useful to me on several levels: I received feedback on my proposals, I was awarded research funds, and I had the opportunity to assess and provide feedback on other students’ proposals. In fact, this inside view of how grants are assessed was the most helpful part to improve my grant writing skills. I definitely recommend it if you get the chance! 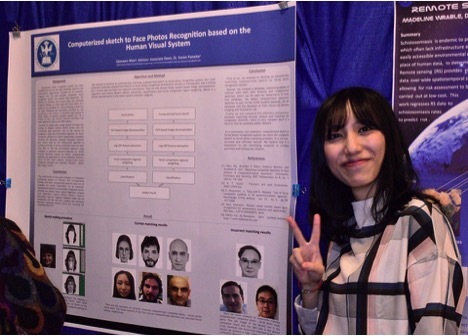 One project I conducted was a collaboration with the Tytell lab. 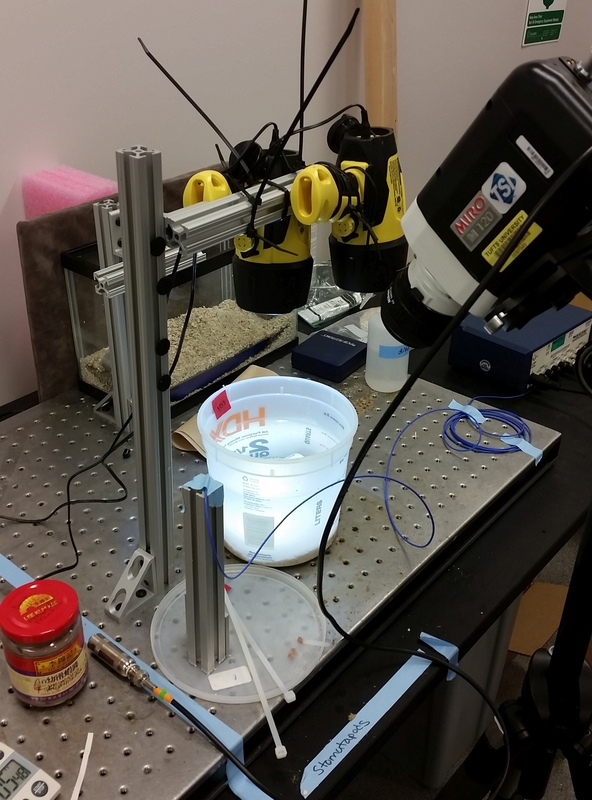 They lent their expertise in biomechanics so that we could measure force of mantis shrimp punches. Throughout my time, I secured enough funds to go to Belize six times. Part of the reason I could schedule so many trips was that the Bio Department is very supportive. If necessary, we can TA two classes in one semester so that we can go on fieldwork in the next semester. We also are financially supported over summer, which is essential as most ecology grad students need to do fieldwork over summer. My field trips not only gave me that chance to dive the Belizean barrier reef, but I could conduct research in the natural environment of my study species (mantis shrimp), and meet marine biologists from across the US. It was an amazing opportunity I’ll never forget. 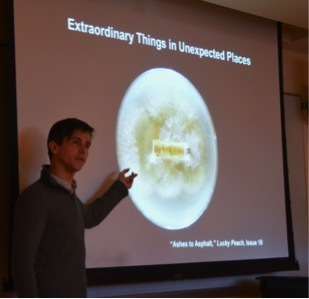 Another great thing about Tufts is the faculty. Everyone wants the grad students to succeed and are willing to help you out if you ask. Even better, they are all so enthusiastic about research and will gladly collaborate on research projects. I have collaborated with other labs in the Bio Department and also with labs outside of the Bio Department. This collaborative atmosphere has allowed me to learn about other research fields and develop different skills. 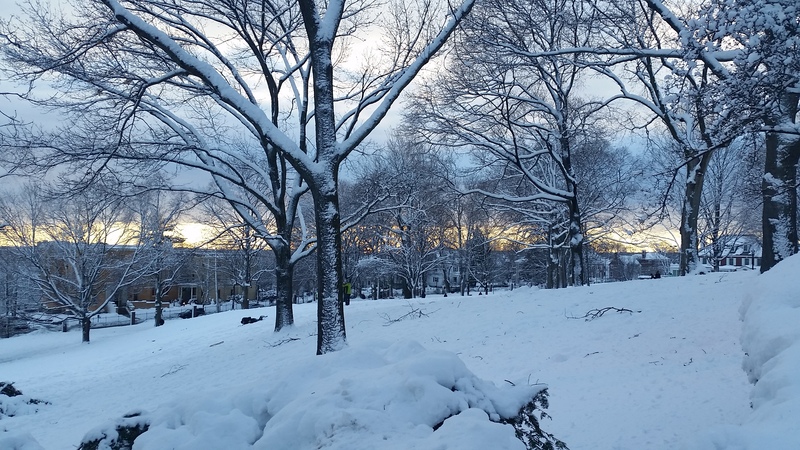 Sunset over Tufts campus after a winter storm. When you need a break from academics, the Tufts campus is so beautiful to walk around. I will definitely miss seeing the four seasons pass by. I spent many days in summer sitting outside and reading papers. I loved to do this on the library roof which has a nice garden and a view out over Boston. Fall was gorgeous on campus with all the leaves changing color. I have a favorite tree that looks like it’s on fire if you catch it at the right time (pro-tip: it’s near the corner of Winthrop and Capen St). I also enjoy seeing Tufts campus with a fresh layer of snow, even though I hate the cold and slipping around on ice. And then my favorite season, Spring, comes along. Trees covered in colorful flowers in stark contrast to the lack of color during winter. It’s stunning. I have so many fond memories of Tufts and my time here as passed way too quickly. It certainly does not feel like almost five years have passed. I’ve tried to see and do as much as I can while I’ve been here, but I still feel like there’s more to do (e.g. I never went whale watching! Don’t worry though, just booked it in for a treat after my defense). So, if you do choose Tufts, seize every opportunity (and there will be many)! Your time here will pass by before you know it. This entry was posted in Research, Student Life and tagged Boston, Fieldwork, Graduate Student Council, Grant writing, International student, New England campus on April 14, 2017 by Amanda Franklin. Join a Tufts GSO, Meet People, and DO Things! 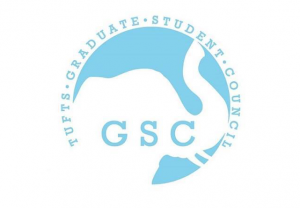 At Tufts, the Graduate Student Council (GSC) sponsors twenty-one (and counting!) Graduate Student Organizations (GSOs). 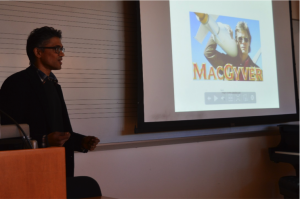 Most GSOs are departmental, such as the Tufts English Graduate Organization, but there are also interest-based GSOs such as the Tufts Graduate Student Anime Club. Being a part of a GSO is a great way to get to know people both inside and outside your department—any GSO event that is funded by the GSC is required to be open to all Tufts graduate students! 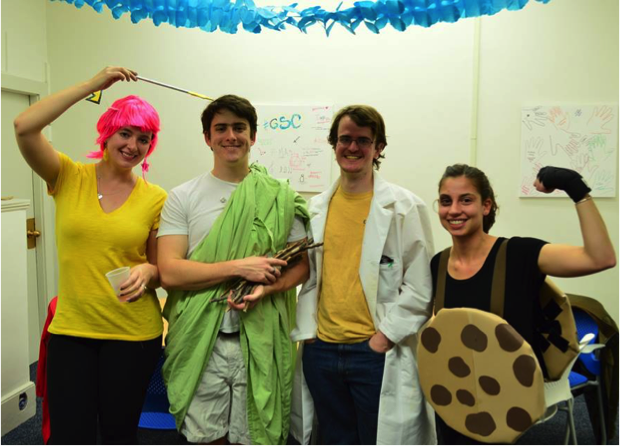 For example, the Biology Union of Graduate Students (BUGS) hosted an ice cream social on May 13, 2016. Since the event is funded by the GSC, the event goes on the Tufts GSC Online Calendar and all graduate students are welcome! There’s almost always something going on! 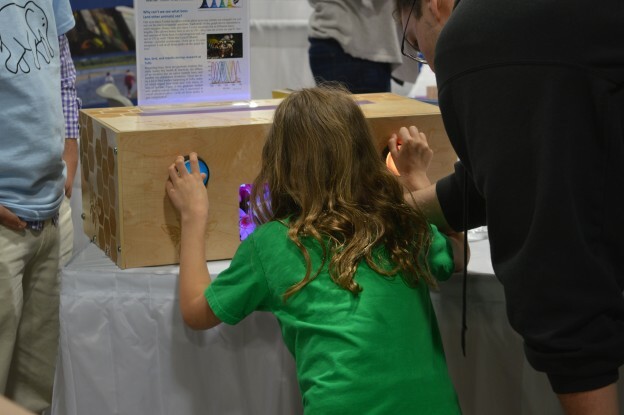 During the 3-day long festival (which hosted over 3,000 interactive STEM activities and 50 stage shows), an estimated 350,000+ visitors came by our booth! Thankfully, we had a team of twelve BUGS at the festival. 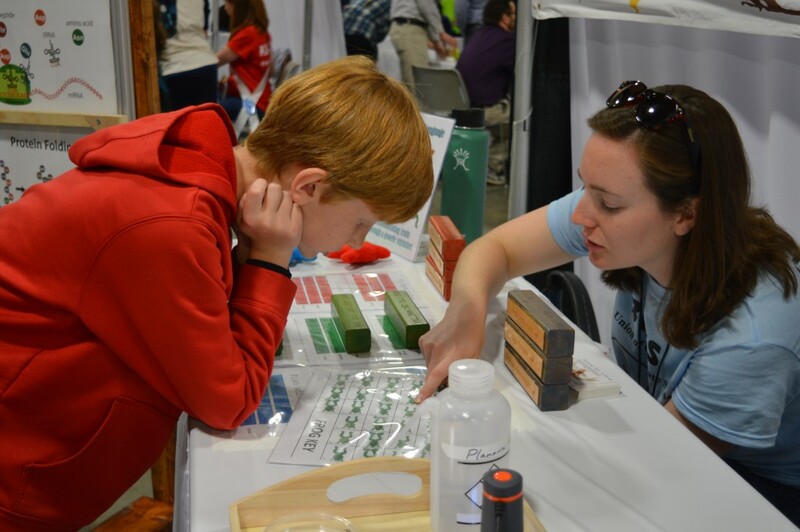 Three BUGS at a time took shifts (about two hours long) at our booth—taking turns kept us refreshed and focused on the activity—and outreach!—at hand. The activity my sub-committee worked on was The Bee Box. 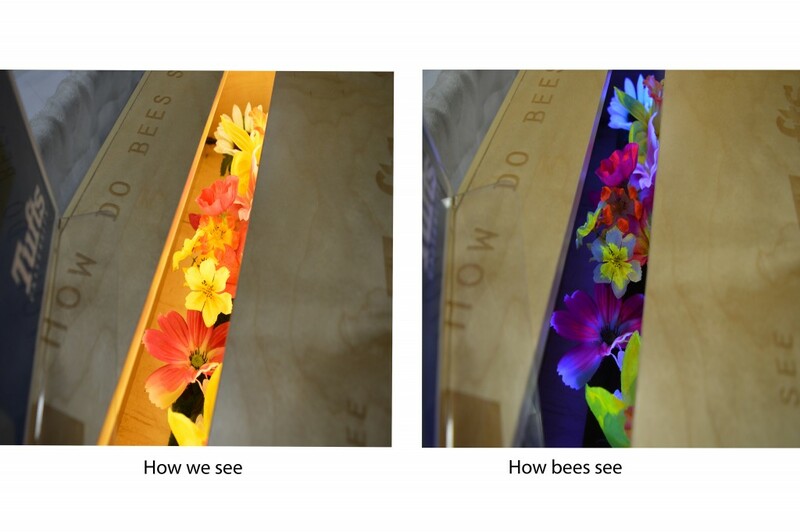 The Bee Box allowed visitors to see how bees see by shining a blacklight on a “garden” inside the box. The blacklight revealed UV patterns on flowers (called nectar guides) that bees use to find pollen and nectar. Without the help of the special light, these patterns are invisible to us! We also brought flatworms (planaria) that allowed visitors to learn about cellular communication. If a flat worm is cut in half, the head portion grows another tail and the tail portion grows another head. You end up with two healthy, functional flatworms! If you block cellular communication with certain drugs however, you will end up with double headed or double tailed worms. 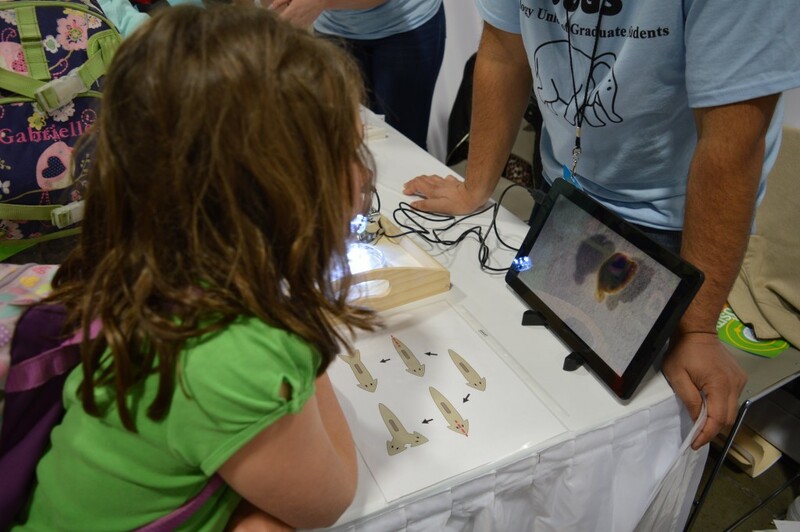 Visitors used a microscope hooked up to a tablet to investigate these worms for themselves. Our third interactive activity taught visitors about the communication between DNA and RNA. Visitors used DNA “building blocks” to build their own model organism. 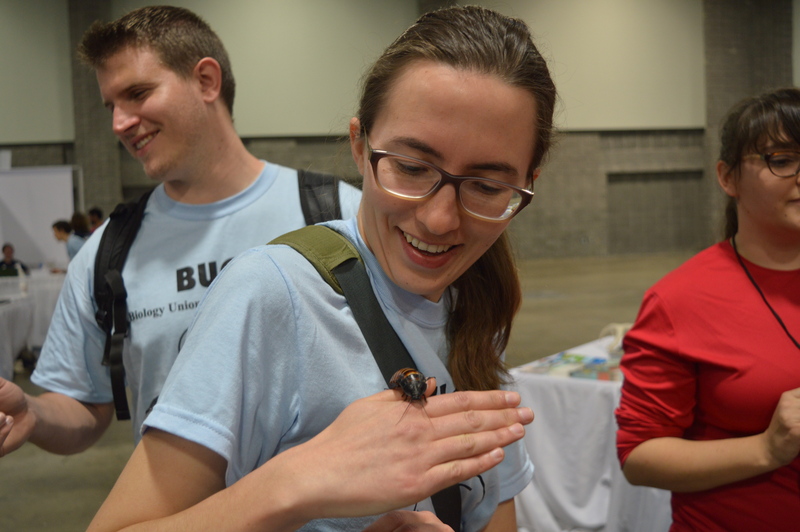 In the end, the festival was a success—for for both the science communicator and the science nerd in me—and and if it hadn’t been for BUGS, I would not have made it there! The festival is held every two years—we’re already looking forward to 2018! 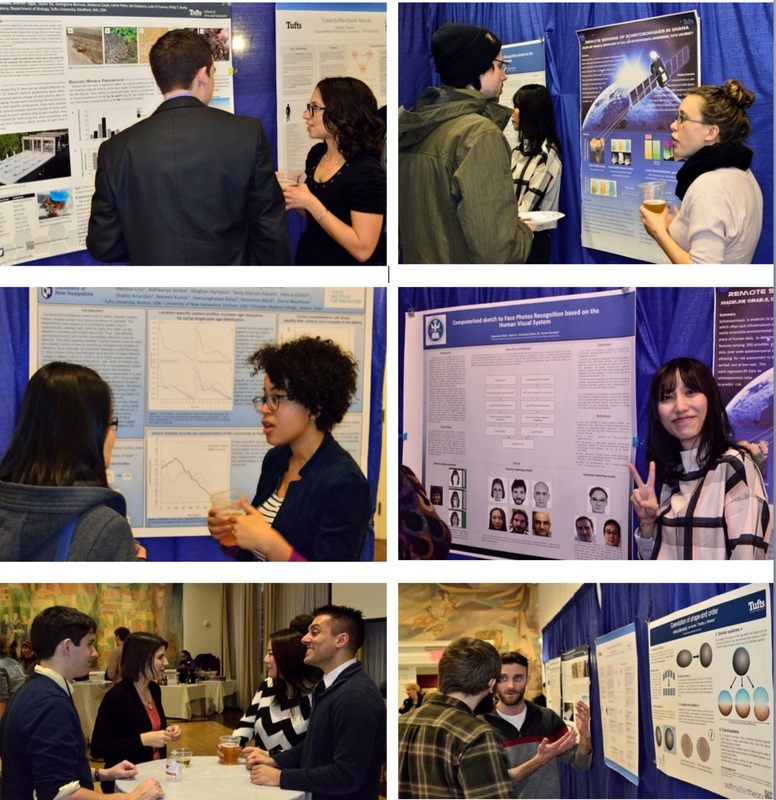 Other Tufts groups represented at the festival were the Center for Engineering Education and Outreach, the DevTech Research Group, the Cummings School of Veterinary Medicine, the Medical School Center for Translational Science Education, and the Bioinformatics Inquiry through Sequencing (BioSeq) group. 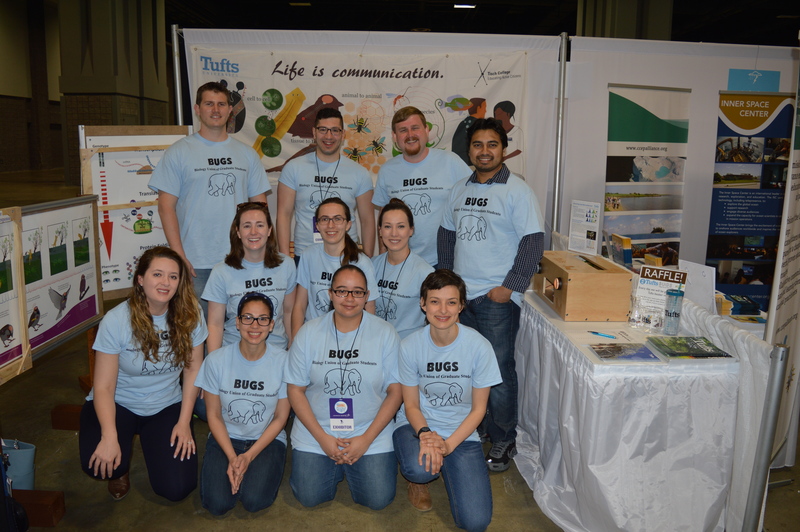 This entry was posted in Student Life and tagged Biology Union of Graduate Students, Graduate Student Council, USA Science and Engineering Festival on May 13, 2016 by Rachael Bonoan. That’s just one of the cheers you would have heard if you were walking around Porter Square early one Saturday evening (November 21, 2015 to be exact). 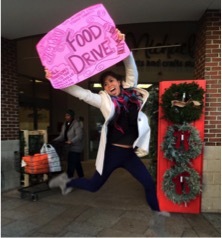 Jenn (Biology grad student) brought lots of energy—and thus, lots of donators—to the annual Graduate Student Council (GSC) food drive. 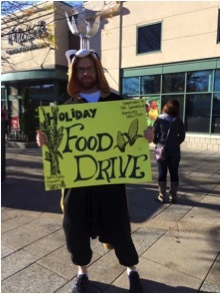 Clint (Psychology grad student) kept warm—and received lots of hugs from strangers—by walking around in his red panda onesie (because, why not?). On a more serious note, the annual holiday food drive is a GSC tradition. Every year around Thanksgiving, the GSC Community Outreach Chair (this year, that’s me!) rounds up volunteers to collect donations of non-perishable foods outside of Star Market in Porter Square. All donations are then brought to the Somerville Homeless Coalition. The Coalition’s Project SOUP (Share Our United Pantry) is a food pantry that hosts community suppers and distributes food donations to those in need. This year’s GSC food drive was such a success that we may have overwhelmed the Project SOUP volunteers…but in a good way! 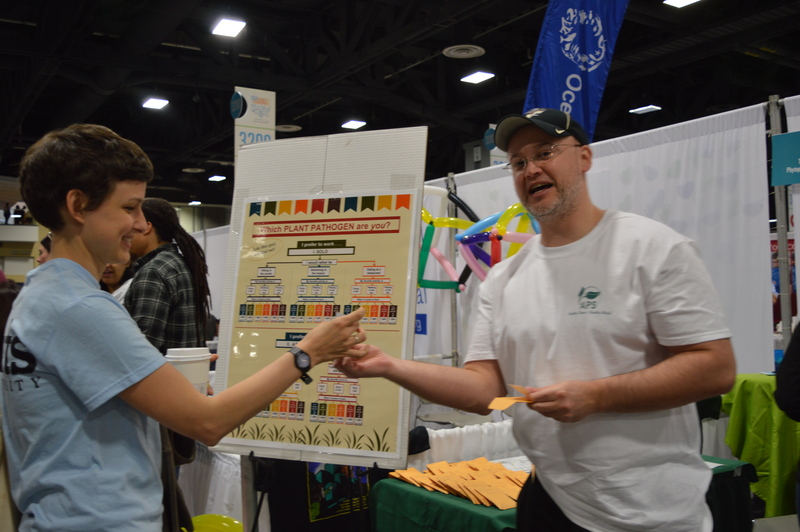 This year, we had a total of 14 volunteers throughout the day, 11 of which were grad students representing various departments (in addition to Biology and Psychology, we had grad student volunteers from Physics, Economics, Computer Science and Drama). Those 14 volunteers collected 17 boxes of non-perishable food! At the food drive, we also received $197 in cash donations (which we turned into some of those non-perishable food items). When our cash donations started piling up, a couple of volunteers would go into Star Market to use the cash to buy more non-perishable donations. At the suggestion of our GSC President, Jeremy, most of our cash donations went toward buying baby food—something most people don’t consider when donating to a food drive. At one point, Jeremy and I went into Star Market with $49.71 to spend on baby food. As we piled roughly $50-worth of baby food onto the conveyor belt, the cashier likely thought Jeremy and I were young, struggling parents with multiples (triplets?). There were people who came out with whole shopping carts full of donations, whole shopping baskets full of donations, and one man even went home to clean out his pantry—he brought us three bags of canned goods, oatmeal, and rice. 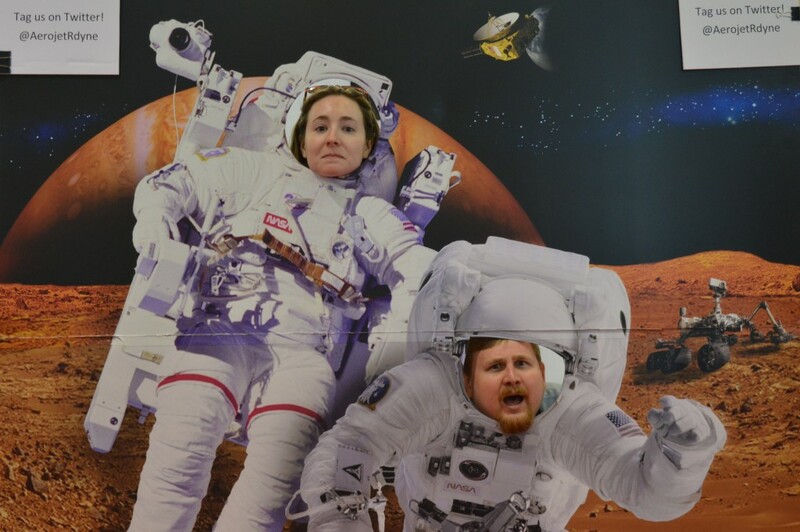 There were also a lot of kids who would shyly put a canned good or two on our table—one was dressed as an astronaut! 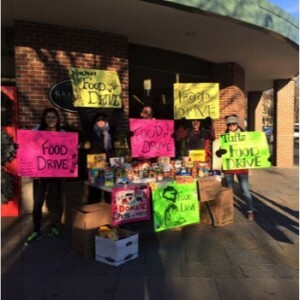 This entry was posted in Clubs and Community and tagged Community, Food Drive, Graduate Student Council, Holiday on December 4, 2015 by Rachael Bonoan. 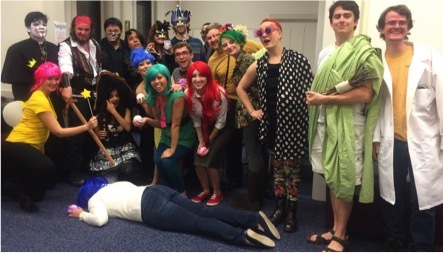 This year, the Graduate Student Council (GSC) put on a Halloween party in our newest graduate student lounge (which is likely to be a topic in a future blog post)—Curtis Hall. The party was planned and executed by this year’s wonderful Social Chair, Taylor Sands-Marcinkowski (Wanda from the Fairly Odd Parents). The other executive board members (pictured to the right, photo courtesy of Psych grad student Clint Perry) that helped pull the party off were President Jeremy Watcher (a Roman dictator with his sticks as a sign of authority), Secretary Mike Pietras (computational scientist—he’s actually a computational scientist), and yours truly, the Community Outreach Chair (a tough cookie). Our other executive board members (Vice President, Treasurer, Academic Chair and Student Life Chair) were unable to make the party—they were in Los Angeles representing Tufts at the 29th Annual National Conference of the National Association of Graduate-Professional Students. Even though they were in LA, I think we had more fun in Curtis Hall. At the party, we had LOTS of candy, other snacks, and a costume contest! 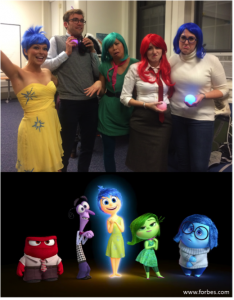 The first place winners of the costume contest came dressed as the characters from Pixar’s recent movie Inside Out. From left to right, Kasey, Dave, Jenn, Becca, and Kelsey are all affiliated with the Biology Department here at Tufts. Kasey and Becca are recently graduated master’s students, Jenn and Kelsey are 6th and 5th year Ph.D. students respectively, Dave is a graduate student at MIT and Kasey’s boyfriend. This year, the first place prize was a gift card to Foundry, a nearby restaurant in Davis Square (another possible future blog topic). Kasey—as Joy—was characteristically overjoyed that her group won the costume contest (notice her feet are a good few inches off the ground). Our second place winner was on the other end of the Halloween spectrum—he was scary. 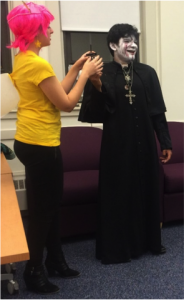 Parading as an exorcist priest, the international Physics grad student went above and beyond for his first Halloween! The exorcist priest won a gift card to Diesel Café, a coffee shop in Davis Square for his prize. Among other characters, we also had pirates, a woodland nymph, Maverick, and Luna Lovegood show up at the party. (Sadness got really into her character for the group photo.) What I like most about GSC social events is that I get to get out of the Biology Department and meet grad students from other departments. At this party alone, there were grad students from Biology, Chemistry, Physics, Computer Science, Engineering, Drama, and more! The GSC’s next holiday-themed event is our Thanksgiving Food Drive—coming up soon! 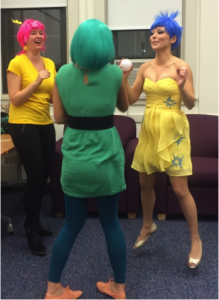 This entry was posted in Clubs and Community and tagged Graduate Student Council, Halloween on November 1, 2015 by Rachael Bonoan.